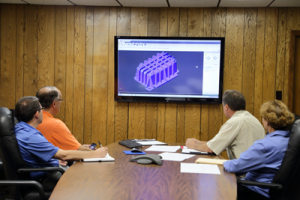 Early design review meetings with our engineers and toolmakers. Onsite or virtual meetings to facilitate communications with key personnel. Assigned FM Corp Project Engineer. Access to FM partnerships with tool makers, prototype companies, and suppliers. Early identification of design service needs. Competition in the market is overwhelming and getting the project done on time, on budget, and without manufacturing issues is everyone’s goal. Let FM Corporation help you simplify the design process with Early Supplier Involvement (ESI). FM knows that many companies are stretched thin with manpower, money, and sometimes experience. FM’s engineering group, quality personnel, and manufacturing personnel have years of experience to meet your project needs. In our experience, ESI is most effective in the initial concept, rough draft, and design stages. It is at this point that FM Corporation engineers in conjunction with your design team, can sit down face-to-face or through a web meeting to work out questions regarding part design, ability to manufacture, and assembly concepts. With concepts details in place, initial cost estimates for parts and molds can be pulled together to solidify project budget goals, as well as, time to market goals. Once your company has made the commitment to go forward with the project, FM Corporation is with you every step of the way. We will help with design reviews, time line status meetings, first article approvals, and first shipments. At FM Corporation we know that your success is our success. We want to be with you for the long haul and want to be partners in the business for many years. Contact FM Corporation, today, and let’s get started on your next project!